- They will have to practice the incredibly advanced Patronus Charm. Make arrangements with an adult (and preferably a tall, large man) willing to play the Dementor. When the kids start practicing the spell, it should be their cue to leave the room and go change into the Dementor or “death” costume. 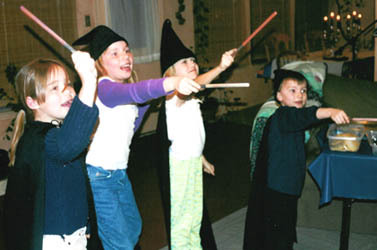 Have the kids look elsewhere when they practice their spells, then have the Dementor “appear” suddenly. After a moment of shocked silence, the kids should rush to scream their charm, their wands pointing straight at the Dementor, who will of course leave cringing!